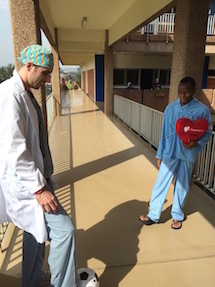 Team Heart is a volunteer organization comprised of doctors, nurses, and technicians that travel to Rwanda to perform open heart surgery on patients with rheumatic heart disease. Surgery takes place at King Faisal Hospital, a private institution in the capital city of Kigali. This year over 50 volunteers traveled to Kigali to perform 16 surgeries. Patients ranged in age from 11-35 and procedures varied from single to triple valve replacements. I joined Team Heart this year as one of four members of the cardiac anesthesia team. I was honored to be able to serve the people of Rwanda in this capacity. In addition to providing intra-operative care for these patients, we also were involved in patient selection and preoperative assessment, ICU management, and outpatient transition care. It was difficult to hear from patients about how they struggled with their disease but it was uplifting to see how excited they were to have a second chance at life. Communication was difficult at times, especially when trying to comfort patients around the anxiety of their procedure and prepare them for the challenges of peri-operative cardiac surgery. Many patients had struggled with their disease for years and thus presented with severe decompensated heart failure. This made intra-operative management particularly difficult, especially in the context of complicated surgical techniques at times requiring replacement or repairs of up to 3 valves. A major initiative of this mission was also to train the local providers on how to perform cardiac surgery. In particular, I was assigned to train a local resident on how to safely perform cardiac anesthesia. Our ultimate goal and legacy is for Rwanda to be able to perform independent sustainable cardiac surgery. The most rewarding aspect of the trip was being able to visit patients post-operatively. It was not uncommon to spend the afternoon with a patient on post-op day 2 kicking around a soccer ball, laughing over my struggles with the local language, or reading together. In addition, having the opportunity to work with the finest nurses and physicians in the Boston area in order to serve the people of Rwanda was truly an honor. I hope to one day return to Rwanda in order to follow my former patients and continue to serve the next generation of Team Heart.